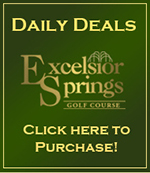 Excelsior Springs Golf Course is located in the rolling hills of Eastern Clay County and is open for daily fee play. Tee times are required Monday through Sunday by calling (816) 630-3731 or from this web site. We specialize in small corporate/group outings of 80 players or less, but can handle as many as 144 golfers with our current cart fleet of 72. One of the very unique features about Excelsior Springs Golf Course is the pace of play, both during the week and on weekends. 4 hour rounds are normal. Another point of interest is the asthetic beauty that you will enjoy during your round. Voted As A "Must Play"
Zoysia fairways, Zoysia and bluegrass tees, small tricky greens and rolling hills, are just a few of the reasons to drive that extra mile for a most enjoyable day on the links. "A FUN , AFFORDABLE PLACE TO PLAY"
MONDAY THRU THURSDAY AFTER 12 P.M.
FRIDAY, SAT., SUN., AFTER 2 P.M.